A port of the classic arcade game Donkey Kong Jr., and a launch title for the Famicom in Japan. 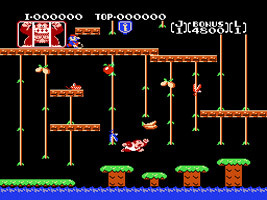 Mario has captured Donkey Kong, and it's up to Donkey Kong Junior to follow them to Mario's hideout. Steal Mario's keys to unlock Donkey Kong's cage in the final stage. This version is largely faithful to the arcade release, with all four stages available, although many of the between-stage animations have been removed.